Christmas for me will always mean temperatures of 32 degrees Celsius. That's 90 degrees in Fahrenheit, and only in the shade. Being in the southern hemisphere, the peak of South Africa's eight summer months begins in December. When I was a child, Christmas meant ice cream, braais (BBQ), grass yellowed by the sun and Chinese emporiums of bootleg games. I lived in Johannesburg up until the mid-1990s. As I recall it, South Africa was a happy melting pot of Italians, Germans, Greeks, Portuguese, East Europeans, Chinese and local ethnic groups. My father, for instance, was a deep-sea fisherman who jumped ship to escape communism in Poland. We were also friends with a family from Hong Kong who left before the impending handover to communist China. Our house always had an eclectic mix of guests, and each nationality influenced our Christmas celebrations. While I was aware of how America and England celebrated Christmas thanks to films, my holidays in South Africa were very different. There was never any snow except on Christmas cards, and no Santa coming down the chimney, as very few houses had a fireplace. There were also no carol singers walking around at night, due to the extreme violence for which South Africa was becoming notorious. Because of the danger of muggings and attacks at gunpoint, my family was vigilant when going out, and at home we were protected by barbed wire fences, Rottweillers and my father's collection of handguns. We didn't walk anywhere due to the distances between places and the violence that one could encounter. The international trade situation also affected my life. All videogames that I saw for sale at that time were either unofficial imports of legitimate items from America and Japan (there was some official PAL support, but it was negligible), or counterfeits from China, Taiwan and Hong Kong. These weren't the usual cheaply-made bootleg games with faulty menus and broken graphics, like those I bought off Russian smugglers in Eastern Europe at the turn of the millennium. The pirate cartridges I received in South Africa were top quality, complete with little stickers around the edges explaining that my 30-day warranty would be void if I tampered with it. My first experience with games occurred in 1991. It was Christmastime, my favorite time of year since I had the whole month of December off from school. We were visiting our friends, the Lai family from Hong Kong and their son Kit who was around my age. 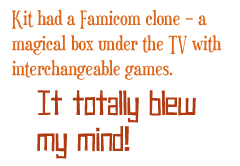 Kit had a Famicom clone - a magical box under the TV with interchangeable games. It totally blew my mind! One multicartridge had 42 games on it, including Star Force, Ice Climber and Adventure Island, though in the latter's case we couldn't read the Japanese title and so named it "that skateboard game." I wanted one desperately, and with unparalleled fervor my nagging engine went into hyperdrive. It was nearly Christmas, and I'd been especially good, so my parents talked with the Lais about buying a Famicom clone for me and my brother.